BG REIT is an index based on the free-float-adjusted market capitalization and shall cover 7 (seven) issues of common shares of special investment purpose companies that operate in the field of securitization of real estates and/or land, i.e. real estate investment trusts (REITs), with the greatest market value of the free-float and the highest median value of the weekly turnover during the last 6 (six) months. The two criteria shall have equal weight. Here are the companies in the list, plus FairPlay. I have highlighted the REITs with book value less than 1 and leverage less than 1.5. Those are the ones that I consider good starting points for further research. It is important that book value is less than 1, because IFRS allows upward revaluations of property, plant and equipment. While for US companies you can have some safety from the fact that land and properties are on the books at low historical prices, this is not the case under IFRS. Book value is closer to (sometimes even higher than) market value. So, in order to have a margin of safety on this count, you need a decent discount to book value. Low leverage is another factor value investors pay a lot of attention to. In the case of REITs, it has even more weight. Not only do REITs have to make large investments, but they also have to go through long periods in their business cycle when funding is very hard to come by. This is why I am looking only at companies where debt is no more than half the equity. As you can see in the table, FairPlay (6F3) is the cheapest in terms of book value. Its leverage is at the high end of my range. Yet, I preferred to focus on FairPlay instead of on Active Properties (5AX). The reason is that many of Active’s developments are at a very early stage and the properties are not as attractive. For example, its largest project is for a residential complex in my hometown, Plovdiv. As you can see from my post on home prices in the 4 major cities in Bulgaria, Plovdiv has the lowest average prices. Business in the city, and the whole area, has been losing steam even before the crisis compared to the other 3 major cities. BREF (5BU) is second on my list, after FairPlay. The fund has relatively balanced portfolio – almost equally split among retail properties, investment plots, and cash. From what I’ve read so far, BREF has good properties and has managed to sell profitable some of them. Earnings per share have fluctuated expectedly in the past 5 years, but the company registered a loss only in 2009. This year EPS will come at BGN 0.03. The 5-year average is 0.06. This is a 11.7% yield on the current price of 0.515. But where BREF stands out from the group is its cash cushion. As the fund sold properties and cut debt, net cash reached 2/3 of its market cap as of the 3rd quarter. The very low debt, high net cash, and price at 40% of book provide a good margin of safety. Finally, BulLand Investments (5BD) has two features unique to it. Out of the group, BulLand is the only one using no debt and registering no loss in the past 5 years. 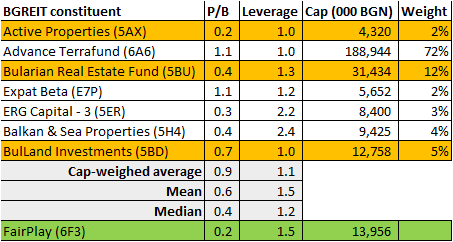 However, it is also not among the cheapest REITs in my group. As of the 3rd quarter, earnings per share have come at BGN 0.09, but the average over the past 5 years is 0.065 – just a 7% yield on the current price of 0.93. This is why I don’t find it as attractive now as the two options above. I will go on with my analysis and at some point, I can see myself holding positions in the REITs shortlisted here. For those interested, I believe this will provide a good starting point for further research. By the way, if you run the links through Google Translate, you will get a decent idea about the companies, including the summary financials.